Construction is fertile ground for complications. Beginning with the basic on-time/on-budget obligations despite circumstantial uncertainties like weather, and material and subcontractor availability, general contractors assume a fair amount of risk long before ever breaking ground. Mix in the need to truly understand and achieve the owner’s long-term vision and the process of working with architects, engineers, stakeholders and the various authorities having jurisdiction on a particular jobsite, and myriad potential hurdles grow exponentially. While every contractor’s approach is unique, few would disagree that collaboration is essential. 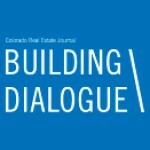 For Adolfson & Peterson Construction, a national firm with a Colorado presence for more than 30 years, collaboration is more than just a process, it’s a promise. manager/general contractor through a competitive best value selection process. A key merit of CM/GC is that while the contractor and design team are contracted independently, they are jointly responsible for solving design and construction challenges. 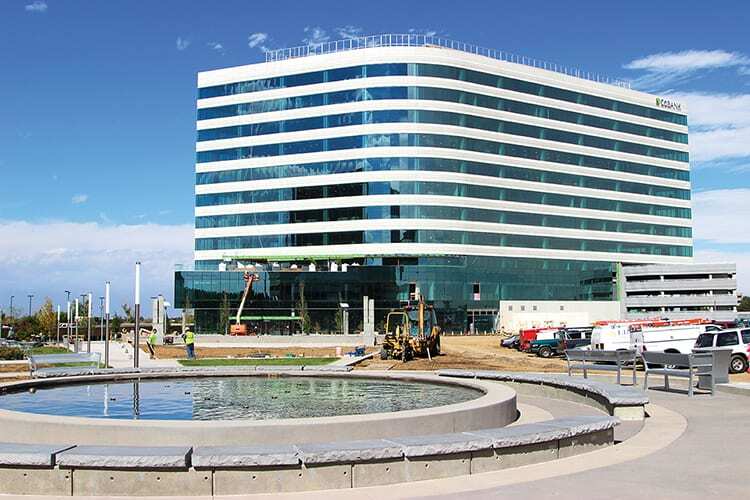 When A&P was brought on board in January 2014, it joined the ownership team and a dual-architect design team led jointly by Davis Partnership (core/shell) and RNL (tenant finishes). With both architects having independent mechanical, electrical and plumbing design consultants and an interwoven series of core/shell and tenant finish areas overlapping within the building, the importance of collaboration was magnified. 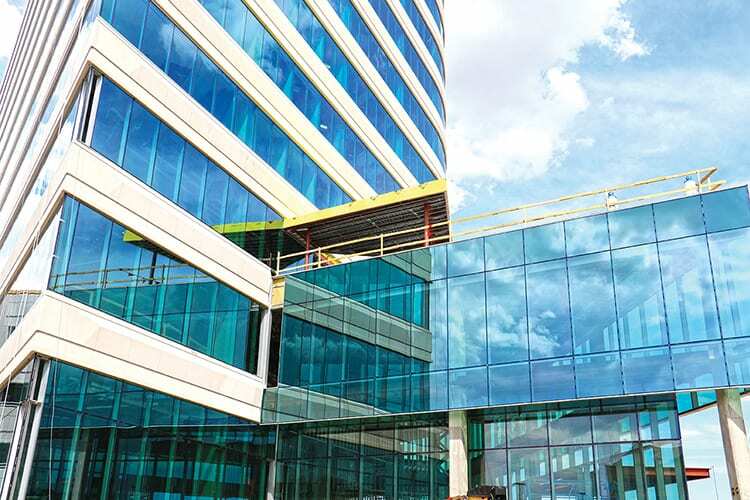 Since core/shell design necessarily advances faster than tenant finish drawings, one of A&P’s key responsibilities during preconstruction was to ensure a seamless overlap during construction. 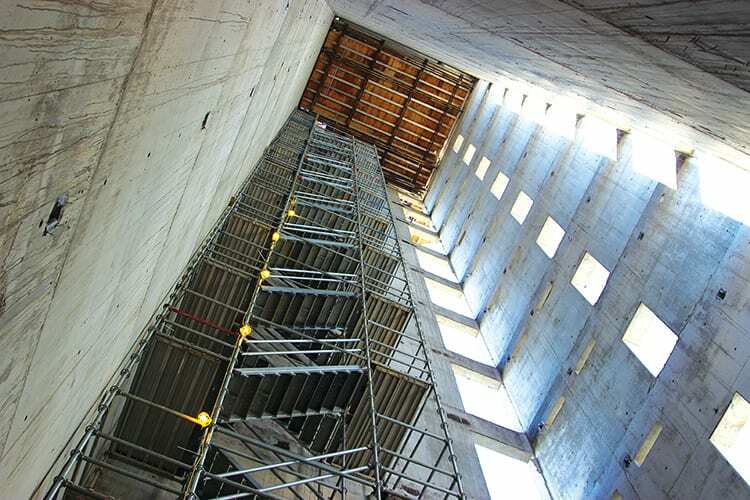 For example, the central stair tower is a core/shell component but logically interfaces with the tenant finishes for each floor to accommodate IT cabling, material choices and the precise alignment of internal connections. By taking a leadership role in team communications and incorporating comprehensive 3-D building information modeling, A&P worked to balance all interests and maintain steady design progress. Just as the construction manager should serve as a conduit for facilitating design and constructability integration, there is also a significant opportunity to build proactive relationships with the regulatory entities with permitting oversight. In the case of CoBank, that included the city of Greenwood Village, South Metro Fire Rescue Authority, RTD, and the Southgate Water and Sanitation District. “It’s important to understand all applicable building requirements and scrutinize the design to trouble-shoot potential permitting conflicts,” remarks Anderson. 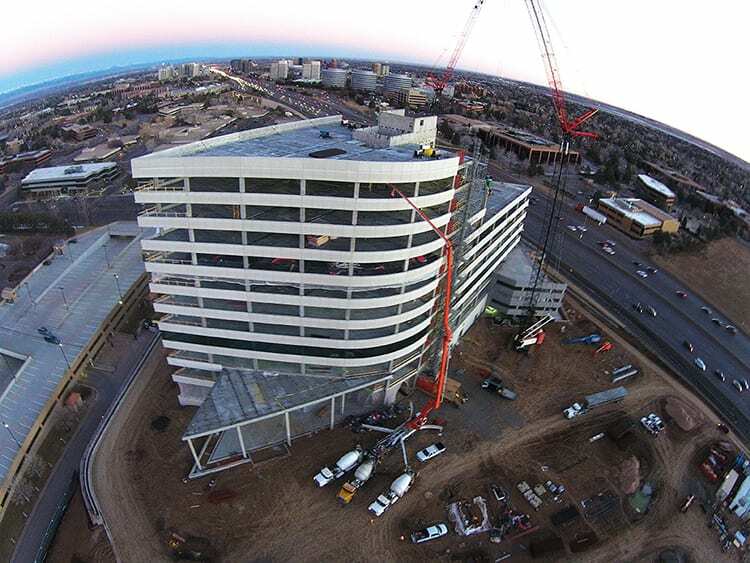 “To be effective, we have to build trust and confidence in our decision-making with the owners and design team and ensure inspections are completed without adverse impacts to the overall schedule.” Adding complexity to the permitting process was CoBank’s desire for a phased occupancy allowing move-in to begin in the lower portions of the building first in December, with the turnover of the upper floors happening in early 2016. The 11th floor will be built only to the core/shell level until a tenant lease is secured. To ensure the fully functional life-safety system was operational prior to the release of each floor, A&P worked closely with South Metro Fire Rescue Authority to understand and meet occupancy requirements. One of the earliest decisions made after A&P’s selection was the structural system. With drawings still in schematic design, A&P’s preconstruction team looked at two systems – steel frame and precast concrete – and developed complete cost estimates, anticipated milestone schedules, and initial logistics plans for both. This presented owners and designers with a detailed picture of how either system would impact the project as a whole. Ultimately, applying a lean construction methodology of “choosing by advantage,” a combination of cost, material availability, speed to market and construction logistics resulted in precast concrete being chosen. 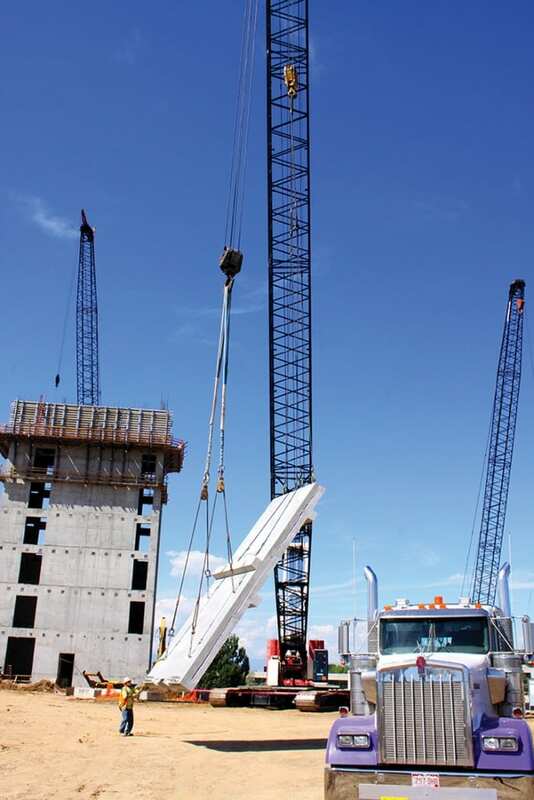 A key advantage of precast concrete is the speed of the erection process. Large precast panels are fabricated off-site in a controlled environment, trucked in and craned into place for assembly like a massive erector set. A carefully developed logistics plan is essential to ensure each piece arrives on site in the exact order needed and then is moved into place in a precisely choreographed process. In total, 2,686 pieces of precast were placed and linked together by more than 500 tons of rebar and nearly 60,000 embedded connection plates. With precast deliveries beginning in September 2014 and continuing until April 2015, it was essential that each floor be closed in prior to concrete pours to protect the newly poured slabs from freezing during the winter months. When snowstorms occurred, snowmelt was diverted to prevent damage and large heaters were brought in to maintain slab dryness in wet conditions. Davis Partnership’s design called for contemporary angled disposition relative to adjacent I-25, providing an attractive counterpoint to existing Tech Center office properties and affording mountain views to from nearly every window in the building. This allows unique programmatic uses to populate the first through third floors abutting the parking structure while floors four and above maintain great internal flexibility for future reconfigurations through floor plate uniformity. The juxtaposition of angles results in overlapping orders where the fourth floor stretches across the parking structure. Though Yahn has more than 17 years of experience, all with A&P, facing new challenges is what he enjoys most. Another area that contractors need to consider is construction’s impact on the surrounding community, especially in a location that combines a heavily trafficked commercial corridor with a seasonally populated entertainment venue such as Fiddler’s Green Amphitheater. One of the complexities of the CoBank project was a utilities tie-in beneath Fiddler’s Green Circle, the primary road serving both the venue and the construction site. The scope of work required A&P to oversee the relocation of 250 feet of existing sewer line within a 17- to 20-foot trench dug down the centerline of the road. The sewer line had to be plugged and a temporary bypass had to be inserted while the line was rerouted. This mandated 24/7 oversight of the bypass and coordination with Southgate Water and Sanitation District and transit stakeholder, RTD.